Your support will help show candidates for public office that the general public supports a broad range of progressive programs to help protect democracy and reverse runaway inequality. If you would like to become a Petition Educator, and spread the word about the petition, click here. You can share the petition on social media, too. Click here to share this petition on Facebook. Click here to share this petition on Twitter. Subject: Sign the petition! Show the American Political Establishment that the People support Reversing Runaway Inequality. I signed a petition on Action Network telling The American Political Establishment that we support policies that will work to Reverse Runaway Inequality. Sign and share this platform to demonstrate to our politicians the popularity of ideas that will bring more justice and fairness to our country. 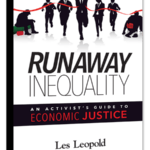 Runaway Inequality addresses the problems faced by everyday working people today. With more than 100 eye-popping and accessible charts and graphs, it puts the facts in your hands so you can grasp what is really going on in our economy – and what we can do about it together.